It’s been a week since I took a tumble down the metal staircase of death. I can’t feel a four inch patch of flesh on my shin, and it stings whenever I step down too hard. the moosh has the uncanny ability to land any and all sharp or hard body parts she owns on my left leg, for this I am grateful, it’s making me tough. GRRR. And it’s teaching me all sorts of creative covers for swear words. How I didn’t break something is truly a miracle. I attribute it to the fact I had just gone to the Temple and was divinely protected. Because honestly? I should be waaay more busted up than this. Oh.My.Goodness!! I’m still in shock that you didn’t break anything?! Are you carrying a portable ice pack around!? That looks so painful!! Oy. 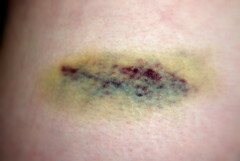 And that last bruise…TECHNICOLOR! *G* Yeesh. Sadie’s last blog post..Seriously, HOW old am I? Wow, Chicago really did a number on you! Yikes, those bruises are crazy…. the kind I envision a person only getting on a football field. Apparently gravity is a tough contender. I’m sorry! Hey, at least you saved the camera! so you are positive you didn’t break anything? What is it with kids that they are somehow drawn to our injuries? It’s so funny that you say you’re finding clever ways to cover your swears. ha! That one’s been uttered from my mouth after one brusing incident or another. LOVE your adorable new header!! Just how positive are you that you didn’t break anything? A week later? You shouldn’t be that jacked up. Pgoodness’s last blog post..Oh my i(phone)! Ow. Ow. Ow. Ow. Ow. Ow and OOOOOWWWIEEEEE! I’m glad nothing is broken and since the colors are so very pretty, I see that you’re healing well. So glad you are OK…my God woman! Wow. Those are some ugly looking bruises. Glad you’re ok. Have Moosh kiss them~if our kisses can make them better, then their kisses surely can cure our ills! oh my good grief…you look worse than a car accident victim. You could be lying in traction right now. Yep…your guardian angel finally kicked in. I *still* have a dent in my left shin from a meeting with a bench in high school. Ok my stomach rolled & my leg cringed looking at those. I’m a wuss, I would so totally have been crying for pain pills & ice packs!! Under the church page there are guidelines for attendance & it says that clothes are not available to be rented… um – are they available at most LDS churches? Is this a normal thing? Is your family LDS also? I have a huge scar on my shin from a similar oopsie. Dang,those photos make my incision HURT in empathy. only i am ashamed to admit that unlike you, i did not fall down a flight of stairs. i merely tripped while WALKING. pop some aleve – hope you feel better soon! I love the new banner! I’m sorry about your leg…tell the moosh that she needs to play mommy and take care of YOU! It was those seriously awesome boots:) And speaking of boots, why don’t they make cool boots like those in your header for adults? ouchie! But you know I couldn’t help noticing your ankles are STILL smaller than mine! ooo. ooo.ooo.I wanna answer the church question! Bellamomma-The thing you read was about renting Temple clothing. When we go to the Temple we change into white clothing. You can either bring your own or rent them there. Some of the new Temples however, are what we call mini Temples and they don’t have room for the cleaning of clothes so they don’t offer rental of (Temple) clothing. Oh that looks like 7 different kinds of painful. The photos are great. I think it was worth the pain. I’m feeling ill just LOOKING at those bruises. Holy crap! That looks painful. i hate stairs. we are lifelong enemies. Holy crap, that don’t look so good. Love the new bloggy header. Too cute! 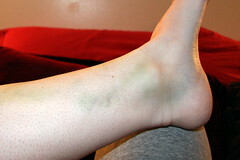 It does seem like lotsa bruising for no breakage. Whew! Holy Cow!! I would be staying in bed and playing that up. Work it for all it’s worth. OUCH! Ouch…I want to cry just looking/thinking about it…which I have, and I feel so bad for you…and so thankful you are ALIVE! My sincerest apologies for the pain would be sent your way except the other night I sat on my foot and when I got up to walk away I stood on the TOP of my foot instead of the bottom and , I think, gracefully flew across my slate kitchen floor and landed like the morning dew! Ok not really but I’d like to think so. I felt my eyes cross and my head spin and the sensation that ran through my body made my unique reaction of hysterical laughing set in!!! All by myself. I was laying there and seriously thought of you! I totally had a moosh moment. I feel your pain sister! I hope you return to your full capacity lickity split! Adria Sha’s last blog post..Misery loves pregnancy. That’s pretty busted up in my book. Sheesh! 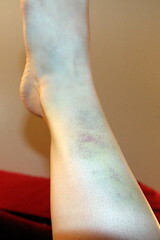 i take pictures of my bruises, too!! i have one that looks JUST like this, but it’s on my shin. my leg is all akimbo (or something fancy) up in the AIR. i thought i was the only one!